Alyssa Byers is a veteran international traveler. Christina Monteleone and Heather Tuell had never journeyed outside North America and Tuell hadn't flown until recently. 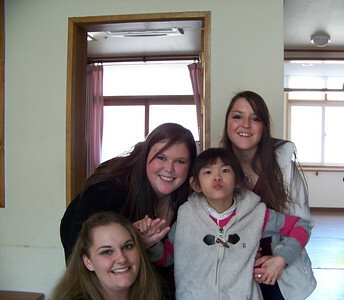 The Indiana State University social work majors spent their 2012 spring break in South Korea, examining firsthand how social work agencies operate halfway around the world. All three were impressed by how advanced the profession is in a nation that only recently climbed from Third World status to the 10th largest economy on Earth. "When it came to taking care of their people, it was definitely a lot more than what we do here," said Monteleone, a senior from Mooresville. "They provide insurance. The hospitals were amazing. There was no hospital smell. 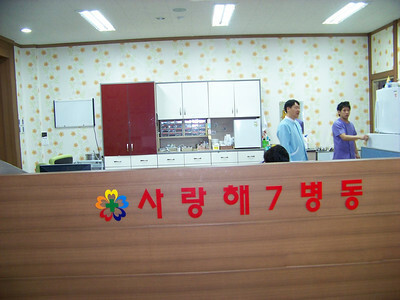 It wasn't white and sterile; it was bright and colorful." Accompanied by Robyn Lugar, professor and chair of the social work department, the three Indiana State students put in 12 hour days visiting agencies and taking part in classes with students at Hanil University in Jeonju, some of whom plan to come to ISU to complete their studies. "They care a lot about people - and not just about their own people but also foreigners," said Byers, whose previous international travels were to France, Germany, Italy, Spain and Ireland. "You go to the hospital and love is everywhere; in the nursing homes there's love everywhere. Here (in the U.S.), you go into a hospital and it's white. There, there are bright colors everywhere. Even the stairs are brightly colored." Tuell, a junior from Odon, was struck by South Korea's very approach to social work. "Instead of looking at a person and asking them, ‘Why are your poor?' or ‘What have you done to deserve to be poor?' they just take care of you," she said. "There are no criteria to blame someone. They're supposed to take care of you so they do." Lugar and her students credit the influence of the Presbyterian Church, which counts millions of South Koreans among its followers. While there is some history of church-based social work programs in the United States, "it is absolutely flourishing" in South Korea, Lugar said. "Universities are graduating divinity students who are double majoring in social work, so those graduates are going out with a social ministry. They're really becoming advocates for social change, which I think is phenomenally fascinating." South Korea is the latest of four nations with which Lugar has launched international social work partnerships since the 1990s. Others are Russia, Finland and Morocco, where Indiana State was instrumental in helping to launch social work programs that have now expanded to all 14 universities in the North African nation. Four Moroccan students were among the early graduates of that program are now graduate students at Indiana State, she noted. While there is much Americans can learn from such nations as South Korea, many of Lugar's international partners are impressed by Indiana State's commitment to providing real world field experiences for its students. "That's what's unique about our program. When I say to these other countries our students are in the field 550 hours, they gasp," she said. Maybe their students are out for six weeks. That's the influence that we have in getting people to have experience while they're in school." As advanced as the U.S. is in many areas, "egocentric" Americans, as Tuell called many U.S. citizens, just might be able to learn from the South Korean approach, all three Indiana State students said. Monteleone cited an agency for the disabled that provides jobs for its clients making envelopes, tofu and bags that are sold to the community to finance the agency's operations. "The United States is supposed to be the best nation and really we're not doing as much for people as we should be," she said. Tuell was struck by the lack of "attachment issues" experienced by youngsters at a South Korean children's home that primarily serves youngsters whose parents have lost their parental rights. "The children hugged on you and they loved on you. When you were holding them they'd just pat you on the back or play with your hair. It was just amazing," she said. "You knew that they were getting taken care of. You knew that they were experiencing love so not only were their nutrition needs being met but so were their mental needs." Byers, who plans to specialize in alcohol and drug addiction services following graduation from Indiana State, was struck by the lack of such services in South Korea, but was even more struck by the reason, which has its roots in the nation's religious beliefs and commitment to family. "They have two parent homes and they'll tell you that and they're proud of that so drugs and alcohol aren't really a big issue there," she said. Now that Tuell and Monteleone have joined Byers as experienced international travelers, they are not only ready to travel again and are urging other students to follow in their footsteps. "I'm already geared up to go to Guatemala next year. I didn't realize that when I transferred (to Indiana State) that it would open so many doors to me. ," Tuell said. "Social work is my passion and it's what I've always wanted to do so being able to do that and being able to do that for a class and travel abroad was just an amazing experience and I would recommend it to anybody," said Monteleone. 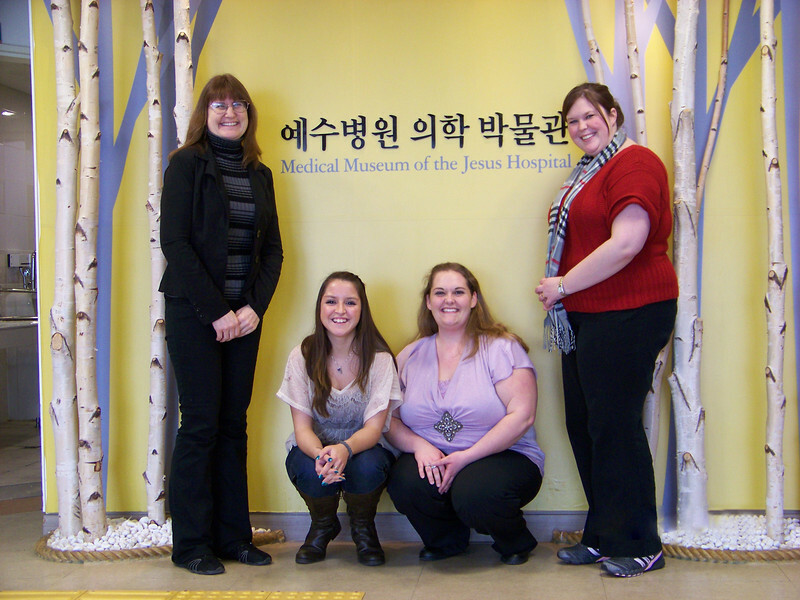 Photo: http://isuphoto.smugmug.com/Category/South-Korea-date-stamp-removed/i-n8h7vsT/0/D/032112southkoreasocialworkroby-D.jpg - Robyn Lugar (left), associate professor and chair of the social work department at Indiana State University, poses with students Alyssa Byers, Heather Tuell and Christina Monteleone during a March 5, 2012 visit to Jesus Hospital in Jeonju, South Korea. Photo: http://isuphoto.smugmug.com/Category/South-Korea-date-stamp-removed/i-F2CTbs5/0/D/032112southkoreasocialworkroby-D.jpg - Indiana State University social work students who traveled to South Korea for a study abroad spring break trip were impressed by the cleanliness and brightly colored rooms inside health care facilities, including Hyosarang Hospital in Kuang-Ju. Photo: http://isuphoto.smugmug.com/Category/South-Korea-date-stamp-removed/i-j3cVSg4/0/D/032112southkoreasocialworkroby-D.jpg - Robyn Lugar (at podium), associate professor and chair of the social work department at Indiana State University, teaches a class at Hanil University for Korean students and ISU students March 5, 2012 during a spring break to South Korea. Photo: http://isuphoto.smugmug.com/Category/South-Korea-date-stamp-removed/i-NDRPqd9/0/D/032112southkoreasocialworkroby-D.jpg - A Korean child hams it up for the camera with (clockwise from lower left) Heather Tuell, Alyssa Byers and Christina Monteleone Mach 7, 2012 during a spring break study abroad trip by Indiana State University students. ISU social work students who journeyed to the Republic of Korea during spring break were impressed by how advanced their profession is that East Asian country.